Naked Donald Trump artist, aka Joshua "Ginger" Monroe, was in San Francisco on Thursday, alongside a new model of a Trump bust, because it looks like he's not going to get his original back. 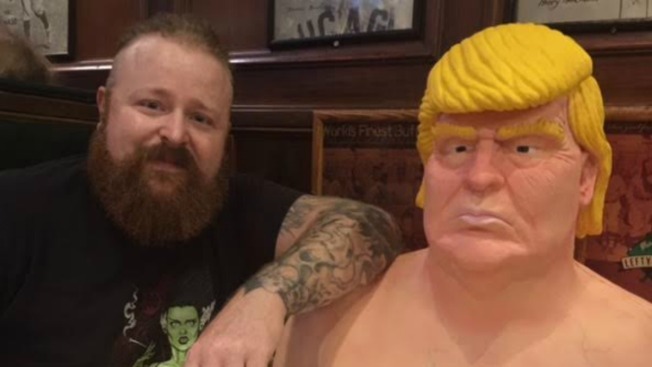 Monroe, who moved from Cleveland to Las Vegas to work on horror film costumes, drove to Lefty O'Doul's hoping to get his larger-than-life-size Trump statue back from police custody. But San Francisco police are not releasing the statue as officers consider it evidence in a felony vandalism case, said Officer Carlos Manfredi. Police have not yet found the people who stuck the statue to the sidewalk in the Castro. Monroe's statues were placed around the country on Aug. 18 by an anarchist group called INDECLINE without permits in a rogue exhibit called "The Emperor Has No Balls." In San Francisco, the Department of Public Works said it cost $4,000 to remove the statue's epoxy base from Market Street. Monroe had hoped he could get his statue out of an evidence room and into his truck, where he could drive back to Vegas and sell it, according to Lefty O'Doul's spokesman Lee Houskeeper. But since that plan went south, Monroe created a new Trump likeness - just the head and shoulders - and planned to party this Labor Day weekend at the popular bar and restaurant anyway. Monroe told NBC Bay Area he loves San Francisco and didn't mind driving to the Bay Area anyway; he was dying to tour the Haight. Monroe said he had also expected, and even hoped that, the statue to be destroyed, like it was in New York. But perhaps the most victorious end for one of his statues happened in Los Angeles, where the owner of a pop culture shop swept up the statue before police got to it. Now, Julien's Auctions is selling the fleshy statue of the Republican presidential candidate, and will give some of the proceeds to an immigrant policy organization.